Here we are, basking in the noonday sun on North Africa's Atlantic Coast at Essaouira, Morocco, following a journey of discovery which began in the Imperial city of Fès and continued via Rabat, Casablanca, Marrakech and beyond. In a few days, we will drive further south for two hours to the resort city of Agadir, with its rows of luxury beach front hotels and casinos catering to the jet set of Europe, Africa, the Orient and Middle East. Most North Americans have yet to discover these two coastal resort cities, and that's a prime opportunity for our magazine, which targets travel professionals. 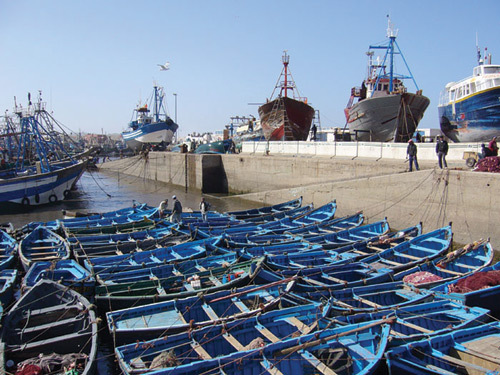 We are enjoying a nautical view of Essaouira's historic seaport, once known as Mogador, from our dockside table at " Chez Sam. " Highly recommended, this charming waterfront restaurant is surrounded by fishing boats and marine activity, from men repairing nets, shucking shrimp and sorting sardines, to the looming skeletons of new boats under construction. For some reason the interior reminds me of Trader Vic's, a popular hangout in my home port of Vancouver in days gone by. The fresh seafood, decor and atmosphere are magnificent and the impressive gallery of celebrity photos ... Louis 'Satchmo' Armstrong, Stevie Wonder and others ... attests to the fact that the owner and founder comes from the world of jazz. Sam and his huge, jet black dog Nikita joined our table a few days later, and thanks to that opportunity, I was able to learn the history of this outstanding restaurateur and the origin of the Essaouira seaport area's most popular eatery. Freshness is the order of the day, every day, here at Chez Sam and at the long row of outdoor stalls, perched side-by-side along the dock area. Each stall offers visitors fresh products from the sea to the table and each competes vigorously with its neighbor for our attention, with barkers, menu boards and tempting displays of fresh catch from the Atlantic. I enjoyed a generous portion of sole fillet and fresh salad for less than five dollars U.S. My two colleagues split a large crab for a similar tab. Overhead a flotilla of seagulls was dipping and diving against a background of crashing whitecaps, rocky outcrops and rugged remnants of the centuries old Portuguese fort that marks the city's place in history. Some call this the "city of winds ... and when we visited Essaouira earlier this week, a minor storm was brewing. Gusts swept the beaches clear of surfers, bathers, wanderers and beachcombers. A few camel drivers still manned their stalls near the far end of the crescent shaped beach, and the waves grew even more fierce as they pounded the shore. But today, near the end of December, 2002, it's as balmy as any spring afternoon, and the buyers and browsers are out in force, filling the Medina with its dozens of shops and stalls. We found an excellent Cyber Cafe right by the entrance and are getting our dozens of e-mail letters ready to send around the world. What a great way to stay in touch - which is why we now carry our own laptop. Arabian Nights On New Years Eve: One of my favorite meeting places in Essaouira is the new 5-star Hotel Sofitel Mogador, located on the main promenade facing the famous beach. That's where we spent one of the most enjoyable New Year's Eve celebrations in years. It started with our being invited to a Fashion Show (left) and continued into the wee hours. For starters, the hotel's dining room waiters were all decked out in Aladdin costumes, and the entire ballroom looked like a scene from Arabian Nights,complete with belly dancers, a Spanish guitar serenade and special visual and musical effects. The entire evening was unforgettable. We then moved to the hotel's beach side restaurant, where the music was going full tilt. We displayed some of our own special items including my regal West African robe in royal blue trimmed in white. One of the models wore Muguette's elegant soft green outfit with contrasting shoulder wrap; both were gifts from Tourism Minister, Sylla Hadja Koumba Diakite of Guinea. We expect to receive some photos of the Moroccan Khaftan fashion segment, which we missed by a few minutes. Famous Doors of Hospitality: Another friendly, convenient place to meet is the Hotel des Isles, which next to the Medina and offers a full range of services. We had the opportunity of meeting the management and will provide more details later in our recommended hotel and resort comments, along with word about Essaouira's new Ryad Mogador and others. I don't know whether my story on Essaouira will ever be completed. Since we spent almost two weeks in the immediate area and met so many interesting people from all walks of life, there is already enough material for a series of travel guides. We met people who are now permanent residents, who came originally from the USA, Germany, France, Spain, Italy, the United Kingdom and beyond, all of whom expressed their love of Morocco in general and Essaouira in particular. Several of these people have riads in the Medina area, and others are located in the surrounding countryside. Great Drives? The whole of Morocco is ideal for enjoyable drives. We enjoyed the coastal route from Essaouira to Agadir,and drove the route from Essaouira to Marrakech twice in a rental car, enjoying every mile we traveled in this fascinating countryside. As a firm believers in the magic of serendipity, I was pleased to meet a very special person who is now a confirmed "Essaouirian. " One day, we were searching for computer internet services and noticed a sign advertising a local travel agency. Venturing inside, we enjoyed some quality time with the owner, George Cook. The timing was perfect, since Mr. Cook moved his company, fleet of 4-wheel drive vehicles, computers and all, to the heart of Essaouira, where he operates Mistral Travel. This group tour operation, backed by a travel professional with decades of experience and key connections in the British Isles, is a valuable addition to the resort city. 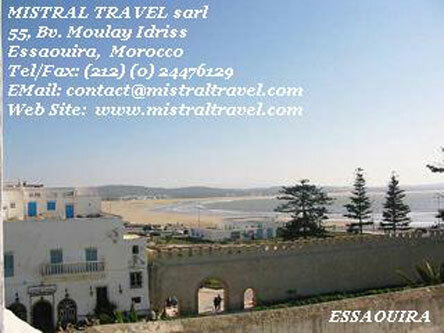 Watch for more information on Mistral Travel on this site and in Africa Travel Magazine. Much more to come in this chapter and series. Comments by Muguette Goufrani: While visiting the Medina in Essaouira, I had the opportunity of visiting an exceptional rIad, called Les Terrasses d'Essaouria, which will be featured in detail later on this website and in our printed magazine. Also on this site is a feature on one of my father's escorted tour company, when we visited a "Wedding Fair" at Hadiddou Imilchil, a Berber village in southern Morocco. The article prompted the following letter from a travel agent in the USA. Jerry W. Bird is President of ATA Canada Chapter, Editor and Publisher of Africa Travel Magazine, and Webmaster for the ATA site www.africa-ata.org. He is also Publisher of Air Highways Magazine, the Journal of Open Skies, featuring aviation, tourism, transportation and business worldwide. His career began with the Edmonton Journal Daily Newspaper, and expanded into the full spectrum of media - radio, television, magazines and Internet. He has won international awards for creativity in audio visual and print production.